My other concern was that the injections would be expensive. In the context of medical horror stories one hears in the news, the cost of dealing with a diabetic cat is not outrageous. The cost is significant, however, and there is much incentive to look for ways to reduce it. Somewhat to my surprise, I discovered that my veterinarian offered the lowest price on the insulin Zeke is using. (The insulin, ProZinc, was the first insulin approved by the FDA specifically for feline use.) My pharmacist could not get the drug, and mail-order houses charge more, so I decided to stick with my vet as my insulin supplier. Syringes were another matter. The first couple of times I bought insulin, I got 100 free syringes along with the insulin, but this was a promotion that has since been discontinued. The next time I bought syringes, I had to pay something like $35, though the 100 syringes did come with a very handy sharps container. Nonetheless, I thought I might find a better deal elsewhere. For quite some time, insulin for humans has been standardized in a single strength, so-called U-100 insulin. The means that every ml of the medicine contains 100 units of insulin. (Originally a unit of insulin was defined as the amount of insulin required to reduce the concentration of blood glucose in a fasting rabbit to 45 mg/dl. The part about the rabbit has been dropped, but that same amount of insulin still constitutes a unit.) The insulin I am giving my cat is U-40 insulin, which is only 40% as concentrated as what people generally use, which allows reasonable dosing for cats without having to measure out an outrageously small amount of liquid. That is, filling a new syringe to the 8.75 mark is equivalent to filling an old syringe to the 3.5 mark. 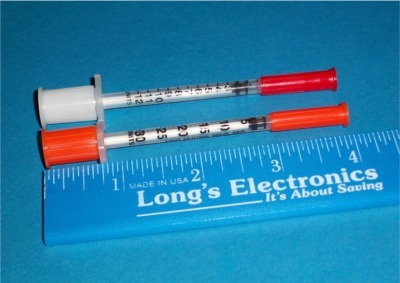 In general, in this case, if d is the dose given with the U-40 syringe, 2.5d is the marking to be used on the U-100 syringe. This is straightforward, but, if you do substitute a U-100 syringe for a U-40 one, be sure to get the math right. You do not want to give your cat the wrong dose. I also saved some money by getting syringe not made by a big name-brand supplier, but this saved only a couple of dollars. 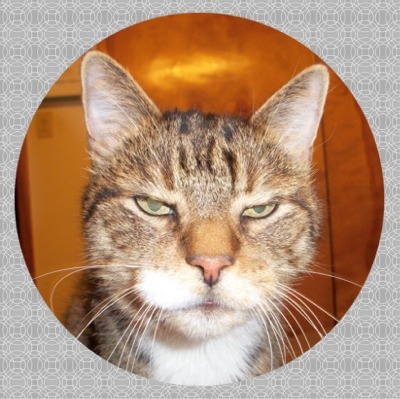 If you are dealing with a diabetic cat, there are some good resources on the Web. The Cornell University College of Veterinary Medicine has a useful page about feline diabetes. The Web site Feline Diabetes includes a lot of practical advice about dealing with a cat with diabetes. Zeke has not been sick for very long, but he has quickly regained weight and seems to be doing well. Good luck with your diabetic cat. Update. Zeke was suffering from kidney failure and had to be euthanized 3/26/2012. Since he was rescued as a kitten, I never knew his exact birth date, but he was about 15½ years old.